HomeLifestyleFoodCelebrate National Eggs Benedict Day With A BLT! 1. Preheat oven to 200°F. Line a baking sheet with foil and place in oven. Fill a saucepan with a few inches of water (this bowl of boiling water will do double-duty as both a water bath and to poach the eggs in). 2. 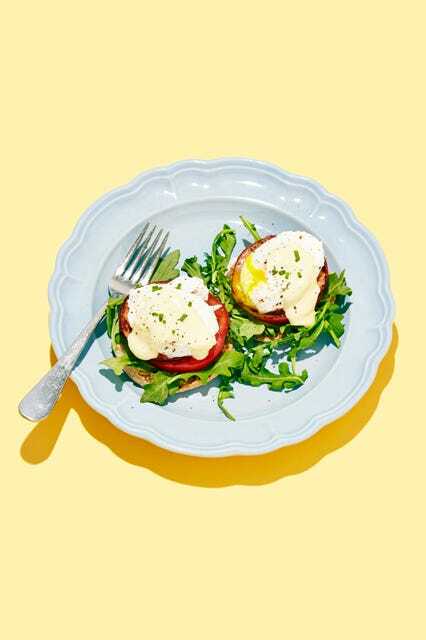 First, make the hollandaise sauce: In a heatproof medium bowl that can fit over the boiling water, add egg yolks, Greek yogurt, lemon juice, mayo, water, and mustard. Place bowl over the boiling water and constantly whisk the mixture until frothy and warm, about 2 to 3 minutes. Stir in melted butter, plus dashes of salt and pepper. Carefully remove the bowl from the boiling water (be careful, because it will be very hot). Cover with foil and keep on the stove to keep warm. 3. Now, things get easier: Add a little more water to the saucepan along with vinegar. Keep on high heat and let water come to a boil. 4. Split the English muffins and toast individually in the toaster. When toasted, place in the oven on the baking sheet to stay warm. 5. Warm a nonstick pan over medium-high heat. Add the Canadian bacon and brown on each side, cooking about 1 minute per side. Transfer to the oven and place on the baking sheet to stay warm. Then, keeping the pan on the medium-high heat, add tomato slices, cooking until soft, about 30 seconds per side. Transfer to the oven to keep warm. 5. Onto the poached eggs: When the water is boiling, it's time to poach the eggs (best to do them one at a time). Bring the boiling water down to a simmer. Crack an egg into a small ramekin or a bowl. Make a whirlpool with the hot water and then tilt the bowl into the hot water, so the egg slips in gently. Cover pan with lid and remove from heat. Let sit until egg whites are set, about 4 minutes. 6. While the eggs poach, start assembling the Eggs Benedict: On each plate, add the split English muffins. Top each one with a little arugula and then the reserved Canadian bacon and tomato slices. When the eggs are poached, use a slotted spoon to gently remove eggs from water onto a couple paper towels to blot excess water. Top each English muffin half with a poached egg and sprinkle with salt and pepper. Whisk the hollandaise sauce — if you need it a little thinner, whisk in 1/2 tablespoon additional water. 7. Drizzle sauce over each egg and garnish with chives. Serve. Would You Rather Be The World’s Tallest – Or Smallest Man?